A sublime treat for the chocolate connoisseur, this gift contains luxurious chocolate items. 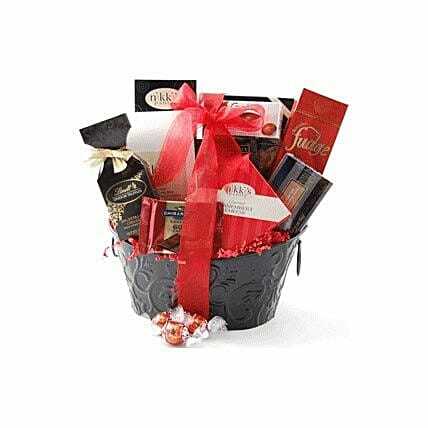 There is delectable chocolate fudge, dark chocolate coconut filled confections, dark chocolate mint delights, a Ghirardelli milk chocolate caramel bar, and a large assortment of decadent chocolate truffles in two beautifully gift wrapped boxes. There are also delicious cookies: chocolate dipped truffle, turtle supreme, old fashioned Scotch oatmeal, and white chocolate Amaretto cream-filled. Not forgetting... White Chocolate Mountain cranberry nut mix, and irresistible chocolate covered pretzels!